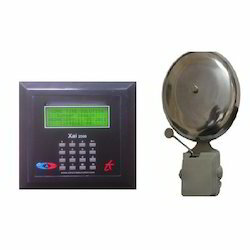 We are a leading Manufacturer of automatic bell from Coimbatore, India. LCD Display for simple programing. Small scale controller based frameworks. Every day 16 and 32 ringer ring projects. The device consists of the Programmable logic controller with inbuilt real time clock facility for time settings. The relay/Contactor in the unit can activate sirens,gong bells or alarms as per customer application. The complete device is mounted inside an IP protection enclosure. Fixed programming model/End user program editable model. Weekly regular schedule, Weekend schedule, morning/evening schedule, summer winter schedule. Simultaneous display of time in 7 Segment display or LCD. Enclosure with IP 65-67 protection against heat/dust/water according to environment conditions.